What are stumperies made of? They are generally made of tree stumps laid on their sides but they can also be made of logs, driftwood and pieces of bark or even railroad ties. I find, however, that using logs and driftwood represent the forest environment much better than manufactured pieces and are much more visually pleasing. Stumps can be used individually or attached together to create walls, arches or artistic groupings. One advantage of using logs individually is that they can be re-arranged again and again. Originally, I had laid the stumps to simulate fallen trees decaying in the forest. My daughter had other ideas and rearranged the grouping into a rainbow. How did stumperies come into vogue? The first stumpery was built in 1856 at Biddulph Grange, Staffordshire, England. Stumperies were considered “horticultural oddities” but were very popular in the Victorian age, just like rockeries and grottos. Ferns were an obsession with Victorian gardeners at this time and stumperies make excellent habitat for ferns and other shade loving plants. Also popular at this time were the new ideas of the wild garden as proposed by William Robinson, which advocated hardy, locally adapted native and exotic plants arranged in naturalistic ways. 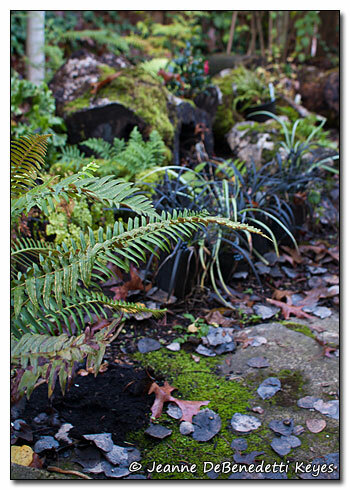 In the spirit of the wild garden, I am using ferns, shade loving, evergreen plants, and Pacific Northwest natives. Sword ferns (Polystichum munitum) and Pacific Bleeding Heart (Dicentra formosa) have already begun to colonize this area. 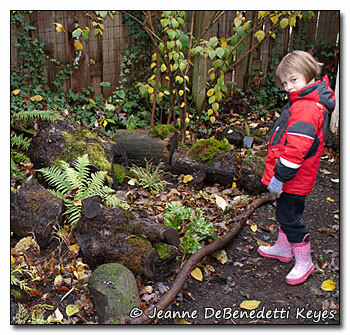 I was thrilled to see licorice fern (Polypodium glycyrrhiza) take advantage of the moist, mossy, rotting logs. 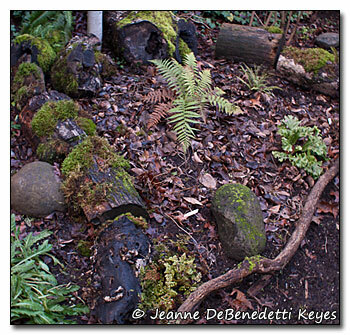 Licorice fern will go dormant with warm, summer weather but always come back year after year. I will also add PNW native bulbs such as trillium (Trillium species) or trout lilies (Erythronium oreganum), hoping they too will naturalize throughout the area. Although the tree fern, Dicksonia Antarctica, in the center of the “rainbow” is native to Australia, and is marginally hardy in my USDA zone 8 gardens with a winter hardiness rating of 20 degrees Fahrenheit, I hope it will stick around for several seasons. I love the luscious foliage. Included in the photograph are hard shield fern, Polystichum aculeatum, and Phyllitis scolopendrium ‘Cristata’ with its showy, frilly foliage.